A limited-time event called "Liberty Fabrics x Bemberg" will be held at Isetan Shinjuku Store and Isetan Online Store from Wednesday, June 6 to Thursday, June 28, 2018. The key figures behind this event, Shunsuke Wakita (right), who is in charge of the Women's Merchandise Division at Isetan Mitsukoshi, and Takashi Matsubara (left), Sales Director at Liberty Japan, share their stories and the highlights of this event with us. 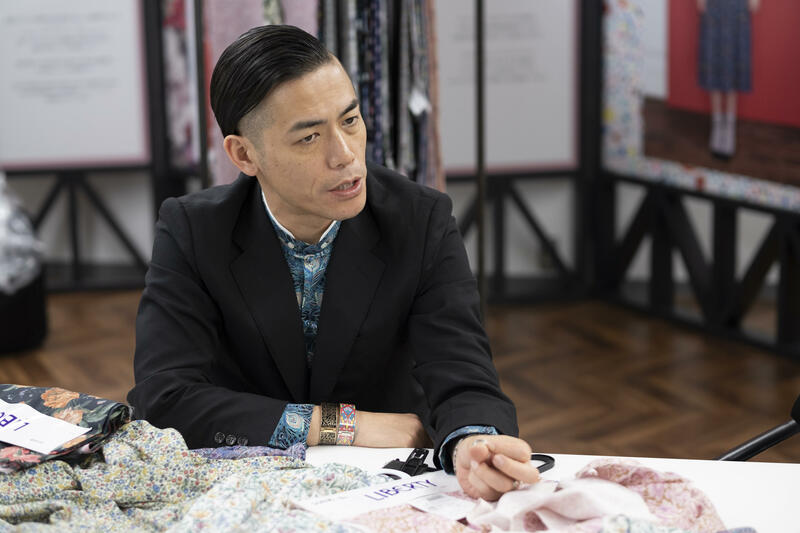 Proposition of ideal summer fashion for working women Wakita (Isetan): This event is designed to propose the ideal summer fashion for working women by combining the aesthetic design of Liberty prints and the high functionality of Bemberg. The event offers 21 models from a total of eight brands. With its excellent moisture absorption and release properties, Bemberg provides a pleasantly cool, refreshing touch, which makes it an ideal choice for a hot, humid summer in Japan. Bemberg blend materials are used in all the products sold at this event, most of which are washable and wrinkle-resistant. 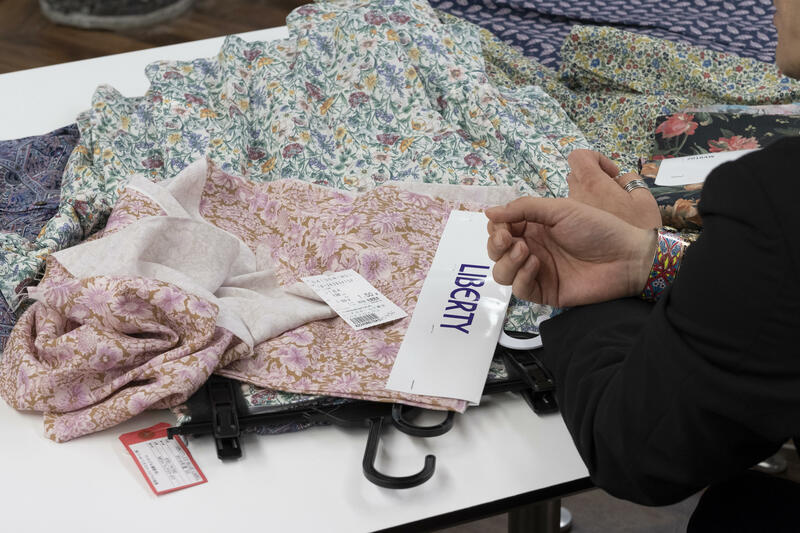 Matsubara (Liberty): Because Liberty Japan is a B-to-B company, no matter how many new fabrics we develop, we cannot make them available to consumers unless we receive an order from an apparel maker for product development. Accordingly, we are very happy to have such a great opportunity here. I do not think that we have ever before had such a large-scale event like this with so many variations of products available in one place. Wakita: I learned about Bemberg for the first time when I visited the office of Liberty Japan, where I saw some Bemberg blend fabrics. Because Isetan already had a relationship with Asahi Kasei through a range of projects we had worked on together for several years, I thought that the three of us could do something interesting. How we convey Bemberg's multifaceted charms to consumers Wakita: Cotton and silk used to sell well during summer. Because cotton is not wrinkle free and silk is often not washable, the sales of both materials have become increasingly stagnant year after year. Consumers are gradually recognizing alternative, easy-to-use materials like Bemberg. In the past three years or so, garments made with Bemberg have become popular in spring and summer. 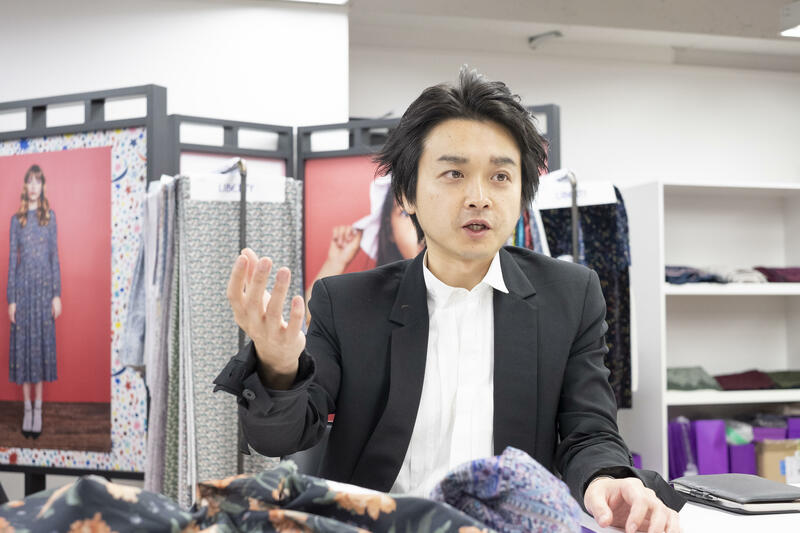 Matsubara: At Liberty Fabrics, the cotton fabric called Tana Lawn accounts for around 60 percent of the annual shipping volume, while Bemberg is one of our special-order materials. I feel a strong emotion when I touch a piece of Bemberg - a sensational texture that I had always wanted to introduce to Liberty Fabrics and convey to the world. In addition to its excellent functionality, as a fashion-based brand, we are excited about how the design will appear on the material. Bemberg also has great appeal from this perspective, with its unique glossy feel and visual quality that tends to look even better after tailoring. Wakita: Another excellent aspect of Bemberg is that it is made from cotton linter, an eco-friendly, sustainable material. Environmental consideration will become more and more important in the future. However, I think it is easier to convey the appeal of Bemberg to female customers who are not familiar with Bemberg when we highlight its sensory characteristics such as, above all, its excellent comfort, fine texture, and as you've just said, aesthetic design, rather than its functionality and eco-friendliness. Perfect blend of summer-friendly features and latest trends Wakita: The highlight of this event is that while the products are summer items released in June, they promptly incorporate the latest prints from the Autumn/Winter 2018 Collection by Liberty Fabrics. Sales of spring and summer trendy items, which have been in stores since February, tend to fall every June because the summer sale is just a month away. In addition, a "buy now, wear now" mentality has prevailed among customers. In the past, many customers used to make purchases a few months in advance - for example, they would buy a wool coat in August and wait until winter comes to wear it. We have seen major shifts in this trend in the last ten years. To respond to these needs, we incorporate the trends of the next season in June while using Bemberg, a functional material that is a perfect fit for the summer season. Matsubara: When we selected the materials at the beginning, we went through quite a tough time, didn't we? Because ease of care is one of the important features we'd like to emphasize this time, we had some thick fabrics that we had to stop using because they were not washable. Wakita: That's right. We had to have so many discussions before we finally decided on the combination of prints and base materials. Subsequently, the apparel maker chose a combination of patterns and materials in line with the brand's worldview and the concept. The aim at manufacturing that provides high value for cost Wakita: Since this event targets working women, it offers a selection of neat clothing that can be worn in the office. Most of the items are dresses and two-piece outfits comprised of blouses and skirts. In particular, two-piece outfits have been popular recently. More people value the consumption of self-improvement and other experience-based services today, and buying clothes is no longer their first priority. Customers now care about how few items they use to create a range of styles that can be enjoyed for a long time. A two-piece outfit in the same fabric will look like a one-piece dress if you wear the top and the skirt together, while you can also pair the blouse with another skirt or the skirt with another top to enjoy different styling patterns. The hidden theme I had for this event was the pursuit of a balance between value and price. In not only the apparel industry but also any other industry, today's growing companies do not just reduce the price but also provide high value for the cost. Whether your products cost 100,000 yen, 10,000 yen or even 1,000 yen, today's discerning customers take a close look at whether they are worth the price. As department stores, we offer high quality to sophisticated customers and therefore, of course, sell merchandise with high retail price. We would like to increase the value we offer so that customers are even more satisfied with our offerings, which is something I am very conscious of now. 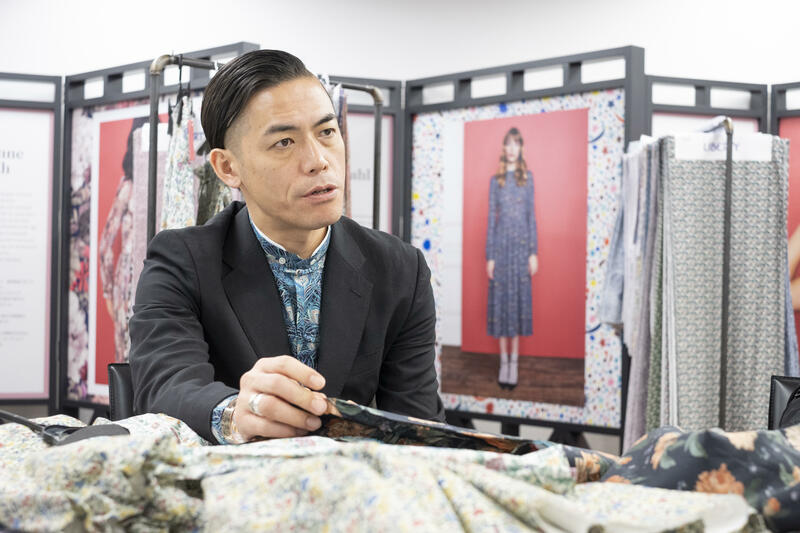 Thus, this event is a result of as much cooperation as possible by Isetan, Liberty Japan, Asahi Kasei and the apparel maker from their respective positions. 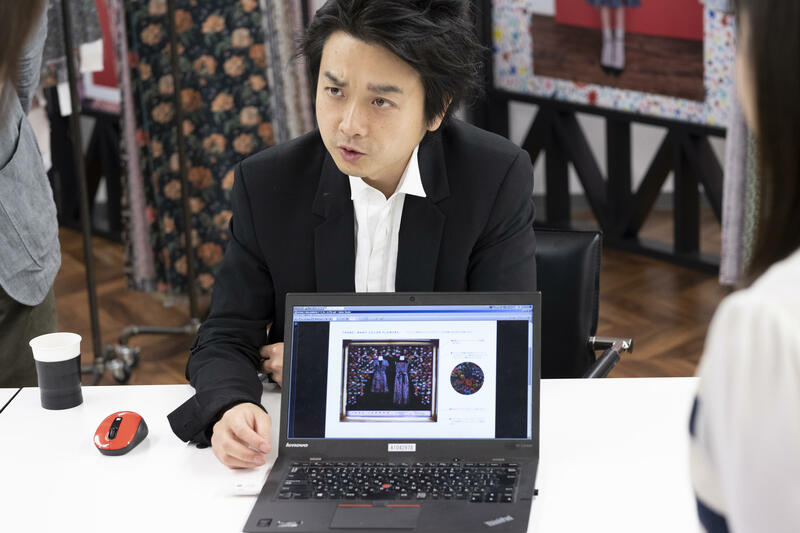 Matsubara: Since these garments were going to be sold only in selected stores, the product volume was not very large. When the order volume is small, the price usually goes up, and there are some other obstacles as well. We asked for the understanding and cooperation of our partners by saying that we would also do our utmost efforts as much as possible. We have received considerable cooperation from Asahi Kasei as well. Wakita: I believe that we were able to make products that provide high value for cost by forging partnerships and cooperation between the four companies. We hope that many customers will use our outfits for Cool Biz this summer. Please enjoy the latest Liberty prints along with comfortable Bemberg and sophisticated design. Career Style Buyer, Women's Merchandise Division, Isetan Mitsukoshi Shinjuku Store Born in 1979. Joined Mitsukoshi, Ltd. in 2002. In charge of womenswear at Ginza Mitsukoshi from 2002 to 2012. Moved to the Merchandise Division in Isetan Mitsukoshi in 2013. Has been in charge of the Women's Merchandise Division at the Shinjuku Store since then. Sales Director, Sales Department, Liberty Japan Co., Ltd. Born in 1973. After graduating from Meiji University, went to the UK to study. Graduated from the Master of Arts in Fashion Studies at London College of Fashion. Joined Liberty Japan Co., Ltd. in 2000. Took office as Executive Officer/Sales Director in 2018. Responsible for the management of all aspects related to sales and sublicenses of Liberty Fabrics in the Japanese market.